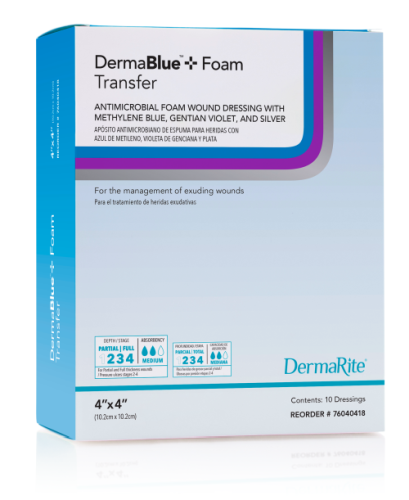 DermaBlue™+ Foam Transfer is a thin foam wound dressing that is highly hydrophilic. Made of polyurethane/polyether foam, Methylene Blue (up to 0.25mg/g), Gentian Violet (up to 0.25mg/g), and Silver Sodium Zirconium Phosphate (up to 7mg/g). The three ingredients provide broad spectrum antimicrobial protection within the dressing. DermaBlue™+ Foam Transfer is indicated for moderately exuding, partial- to full-thickness wounds, including: pressure ulcers, leg ulcers, diabetic foot ulcers, graft wounds and donor sites, skin tears, first- and second-degree burns, surgical wounds, lacerations and abrasions. DermaBlue™+ Foam Transfer should not be used on patients with a known sensitivity to silver or any other contents of the dressing. Not indicated for third-degree burns. For single use only. If signs of infection are detected, a qualified health care professional should be contacted to decide on the next course of action. Product is sterile unless the package is opened or damaged. Do not resterilize. If signs of an allergic reaction are detected, discontinue use of the product and seek advice from a qualified health care professional. Store in a dry place at room temperature. Keep away from sunlight. Cleanse wound to remove residue according to local infection control protocol. Skin around wound should be clean and dry, use skin barrier prep as needed. Dressing may be cut to size prior to application. Dressing may be rolled or layered to lightly pack into wound. Apply dressing directly to wound. Direct contact with entire wound bed is necessary for best results. Secure with tape or appropriate cover dressing that manages drainage and maintains a moist wound environment. Dressing may be left in place for up to three days or as directed by a qualified health care professional. Secure with tape or appropriate cover dressing that manages drainage and maintains a moist wound environment.